Lane Automotive/Comp Cams Heat Race #2 (8 Laps): 1. 26 – Gary Fast, 2. 6n – Dain Naida, 3. 3g – Tim Norman, 4. 29s – Marques Huffer, 5. 31 – Billy Jacoby, 6. 85 – Mike Daggett, 7. 2t – Ralph Brakenberry, 8. 10x – Curt Shumaker. Butlerbuilt Heat Race #3 (8 Laps): 1. 49t – Gregg Dalman, 2. 19 – Brett Mann, 3. 11 – Trey Smith, 4. 23 – Ben Rutan, 5. 50 – Mark Grabil, 6. 187 – Gavin Hunyady, 7. 21 – Matt Lumbert, 8. 14 – Jason Blonde. Total Seal Fast Car Dash presented by Gaerte Engines (4 Laps): 1. 3g – Darren Long, 2. 49t – Gregg Dalman, 3. 26 – Gary Fast, 4. 46 – Robert Huisken. 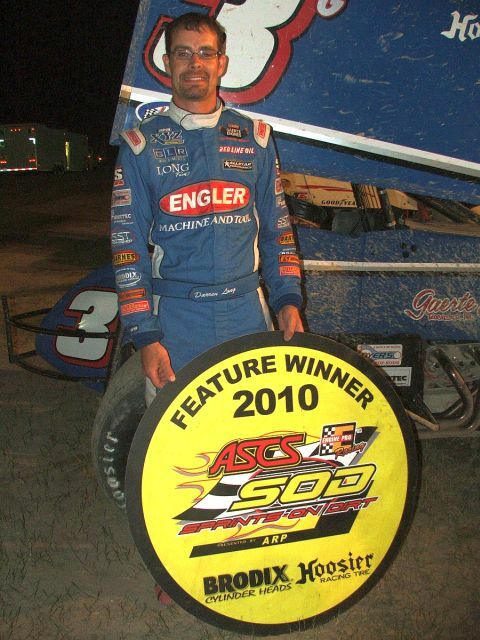 T.J. Buffenbarger, FIFE LAKE, Mich. (June 18, 2010) – Darren Long won Friday night’s Engine Pro ASCS Sprints on Dirt presented by ARP feature Friday night at Cherry Raceway. Long took advantage of the weekend off from the Lucas Oil ASCS National Series to head north and take advantage of starting from the pole and drove away from the rest of the field on the recently revamped ¼-mile layout at Cherry utilizing Gaerte built chassis and engine for JG Motosports. 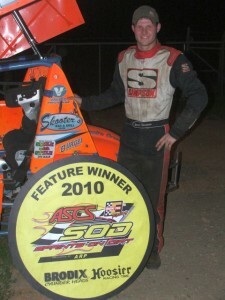 Long and defending ASCS Sprints on Dirt champion Brett Mann started on the front row for the feature event. Long pulled away while Mann lost second position to Joe Bares. While Bares chased after Long for the lead, Mann found himself under pressure from the charge of Dain Naida. Naida arrived late to the track after blowing up a transmission in his tow vehicle. After starting 10th Naida disposed of Mann for third and then ran down Bares for the second spot in slower traffic. Even with Naida’s charge Long set sail with a perfect line on the bottom of the speedway and cruised to the victory over Naida, Bares, Mann, and Gregg Dalman. Both heat race events were won on last lap passes courtesy of Bares and Ryan Grubaugh. Dalman won the Fast Car Dash. Lane Automotive/Comp Cams Heat Race #2 (8 Laps): 1. 00 – Ryan Grubaugh, 2. 19 – Brett Mann, 3. 49t – Gregg Dalman, 4. 22 – Aaron Shaffer, 5. 6n – Dain Naida, 6. 07 – Jake Stebner, 7. 187 – Gavin Hunyady, 8. 70 – Jim Lingar. Total Seal Fast Car Dash presented by Gaerte Engines (4 Laps): 1. 49t – Gregg Dalman, 2. 91 – Joe Bares, 3. 3g – Darren Long, 4. 00 – Ryan Grubaugh. Engine Pro ASCS Sprints on Dirt presented by ARP Point Standings (Top Ten): 1. Ryan Grubaugh 895, 2. Dain Naida 890, 3. Gregg Dalman 838, 4. Ben Rutan 803, 5. Robert Huisken 778, 6. Gavin Hunyady 759, 7. 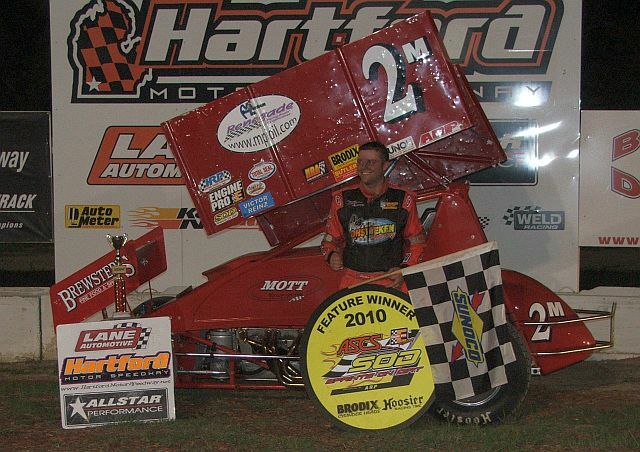 Dustin Daggett 725, 8. Aaron Shaffer 686, 9. Ryan Ruhl 564, 10. Brett Mann 520. TULSA, Okla. (June 14, 2010) – The Engine Pro ASCS Sprints on Dirt presented by ARP teams are busy this week preparing for another two race weekend in Michigan. Friday night the teams will take on the newly reshaped Cherry Raceway before heading south to I-96 Speedway on Saturday. Friday’s event at Cherry is the first since the race track went under a major overhaul during the off season. The racing surface is now wider with higher banked turns for the 2010 season. Due to a rainout last year this will be the first appearance for the ASCS SOD series at Cherry since 2008. After two strong performances last weekend Ryan Grubaugh leads the point standings going into the Cherry by 28 points over third generation driver Dain Naida. 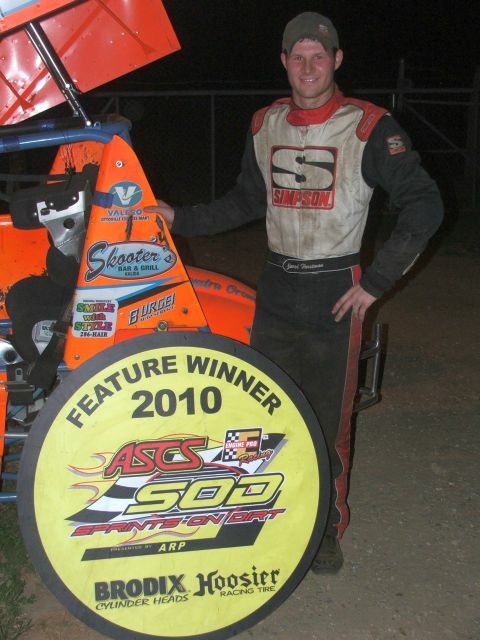 Saturday’s event is the first of three appearances at I-96 Speedway in Lake Odessa, Michigan during the 2010 season. Dustin Daggett has gone undefeated the past two seasons during ASCS SOD competition at I-96 and looks to continue his streak against a formidable field of ASCS SOD regulars and visiting teams including ASCS Lucas Oil Series driver Darren Long. Long finished second to Daggett at the season opening event at Crystal Motor Speedway, looking to improve upon that finish on Saturday. In its 19th year of sanctioning Sprint Car racing, the American Sprint Car Series brings the best of Sprint Car racing to approximately 100 different tracks throughout 30 states and Canada. Anchored by the Lucas Oil Sprint Car Series presented by K&N Filters, ASCS also consists of ten different Regions throughout the nation.